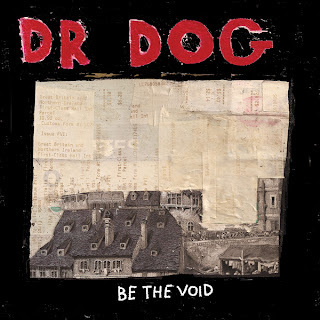 Atlas and the Anchor: Dr. Dog - "Be The Void"
Dr. Dog have recently released Be The Void, their seventh album and second for Anti- Records. Their last album 2010's Shame, Shame which found them recording with a producer (Rob Schnapf) for the first time, who brought out their poppier side and tightened the reigns on their homespun, ragged rock and roll, found them great acclaim from both critics and fans alike. This time around, they took what they learned back to their own studio and once again have created another album with their unmistakable retro vibe and close-knit harmonies but with added electronics and 70's rock muscle in the form of raw guitars, focusing on their live energy. "Lonesome" opens the album with a genuine love-letter to the Delta blues with a ragged acoustic guitars and a rollicking and rickety drum beat along with one catchy call and response chorus. "That Old Black Hole" follows with clever lyrics, a bouncy rhythm and some well placed electronic blips and bleeps on the standout single. Two of the other standout tracks also are the more experimental tracks the band has put to tape in "Vampire" with its growling vocals and a serrated guitar riff and the immediate infectiousness and psychedelic synths and harmonies of the jamming "Warrior Man". After seven albums, Be The Void shows the band's experience and confidence in their craft to consistently create another album that is distinctly Dr. Dog but that continues to expand their sound in new and exciting ways.